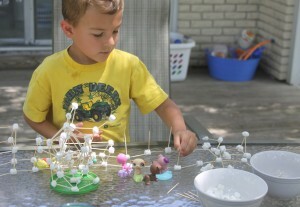 Here is a great activity that will keep the kids busy for a long time – marshmallow and toothpick towers. Grab that stale bag of mini marshmallows from the cupboard and a package of toothpicks. You will be shocked at the amazing stuff your kids will be able to create with those them, and how much fun they will have creating with something so simple. I have been enjoying every second of having both kids home with me for the summer. I can hardly believe that I need to go school shopping in the next few weeks. We have been quickly checking things off of our summer fun list all summer long. 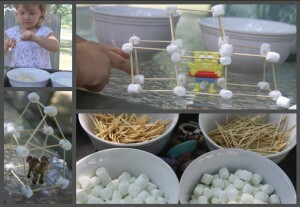 This was an activity that I had added to the list for the summer, but had never tried with the kids before. It is a great activity for preschool aged children that uses things that you already have in your kitchen cupboards. Give your kids a pile of toothpicks and a bowl of miniature marshmallows and see what they can construct with them. My kids had so much fun with this activity, and so did I. We spent almost three hours sitting out on the deck together building towers, constructing roads, and creating a city out of marshmallows and toothpicks. I had to help them at first, and show them the best ways to make shapes using the supplies that they had, but once they got the hang of it, there was no stopping them. The kids each built their own little houses to start with, and then built off of the small house to create a larger structure. They got really creative and it was to fun to see what they thought up to build and construct. They added roads, garages, and even pools using cleaned containers from the recycling bin. I gathered a few of their smallest little toys and they enjoyed using their new marshmallow structures as homes for them. 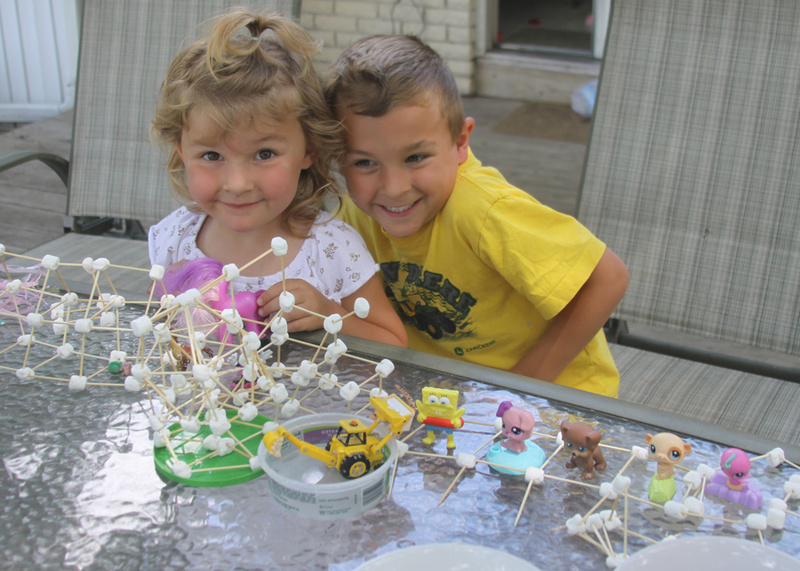 I think the best part was that they were perfectly happy and content building these together and even had me slide all of their separate little creations together so that they could make one massive marshmallow building together! Anything that gets them working together as a team makes me very happy. This was a total hit with them and I will for sure be doing this again with them. I was surprised at how long it kept them occupied, and was so pleased with how much the enjoyed something that is so simple. This is a great thing to do with marshmallows that get left open or need to get used up! Any project that requires simple things that I have on hand gets two thumbs up from me!